The maintenance of energy balance involves coordinated changes in energy intake and expenditure, and these two limbs of energy balance are physiologically linked. The central nervous system receives diverse inputs to coordinate appetite and energy expenditure, and is therefore the key control center for body weight. Despite recent advances in defining the neuronal circuits for appetite regulation, factors that regulate feeding via these pathways have not yet been fully elucidated. TGF-β/ BMP are known to regulate neuronal development. 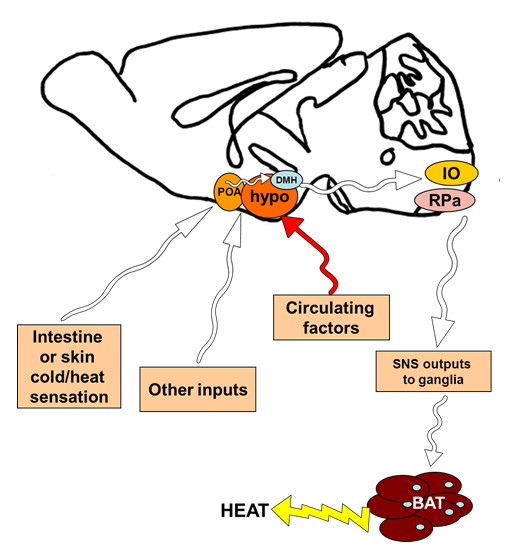 Recently, this signaling system has been demonstrated to be involved in the regulation of food intake and energy homeostasis in lower organisms, such as C. elegans and Drosophila. However, whether a similar pathway in the regulation of energy balance exists in mammals is currently unknown. Recently, Dr. Tseng and her colleagues have discovered that in addition to its role in brown adipocyte development, central BMP7 signaling appears to play a critical role in regulation of food intake. Studies in Dr. Tseng’s lab are currently dissecting the molecular and neuronal mechanisms that underlie the anorectic effect of BMP7. Ultimately, we hope this combined knowledge will allow us to integrate central and peripheral controls of energy homeostasis and aid in identifying specific targets for therapy of obesity and diabetes.